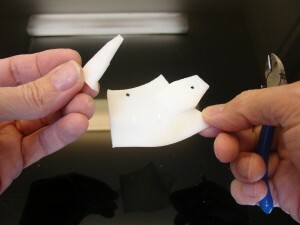 This tutorial is about the assembly of the Mid Stomach parts. 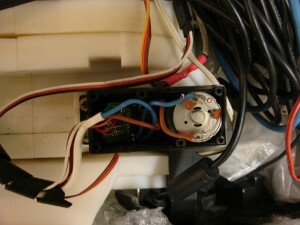 You will need 2 servos HS-805bb which needs to be hacked. Both motor servos will be using only one servo board and one potentiometer, this way both motors will be synchronised when rotating. This will be explained in the tuto. You will need between 65 to 70 ball bearings. You can use steel or BB Gun balls. They should be 6mm diameter. I tried to use Vigor VSD-11AYMB servos and made some files files adapted for it. Unfortunately these servos aren’t good because they jitter sometimes. Another annoying factor is that they won’t “detach” properly through software. 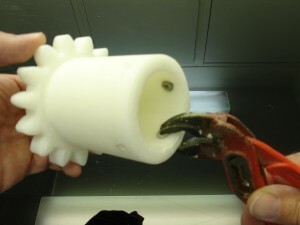 Check that StomGearV2.stl fits correctly into the Top Stomach parts. 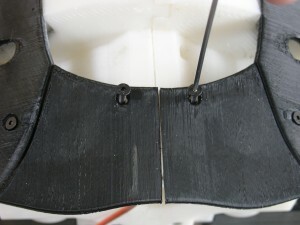 Also make sure that StoGearAttachV1.stl seats well on the bottom surface of the Top Stomach parts. For more info check the tutorial on TopStomach. Assemble together BotBackLeftV1.stl , BotBackRigtV1.stl , BotFrontLeftV1.stl , BotFrontRigtV1.stl. It is best to glue them together laying on a flat surface. 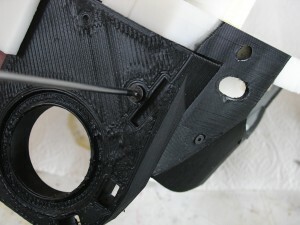 There is also the option to mount bolts for those of you that prefer. Make sure the flat surface is as flat as possible. If the surface is too uneven, glue a sheet of sand paper with double side tape on a flat board, and sand down your assembly until you are satisfied. 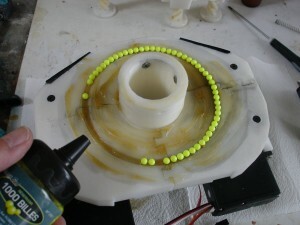 Smooth up the surface where the ball bearing will take place. 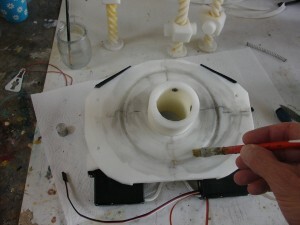 I personnaly used Acetone because my parts are printed in ABS. 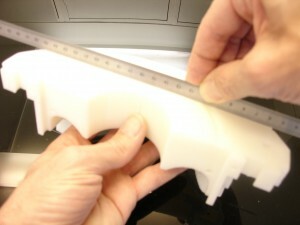 Cut off the pre-support on the HipCoverFrontV1.stl. 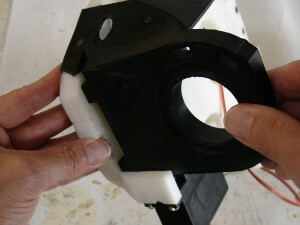 Mount with 3mm screws the HipCoverFrontV1.stl to your assembly. In my case I sprayed the black parts with car aerosol mat finish paint using masking tape. 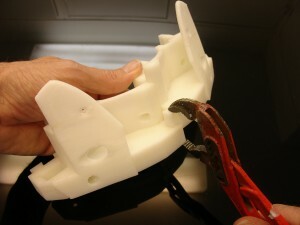 Mount the two MidWormRightV1.stl to the servo horns with screws. 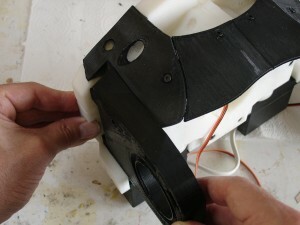 Fit the servos on your assembly using wood screws. 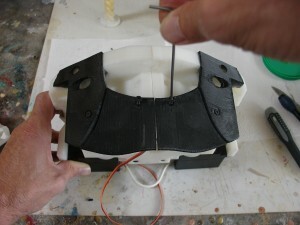 The connection wires of the servos will be detailed later in step3. 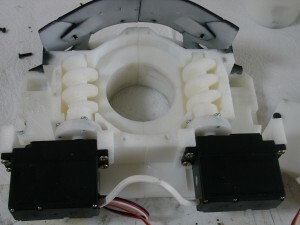 At this stage it is a good idea to make sure StomGear fits well through your assembly. 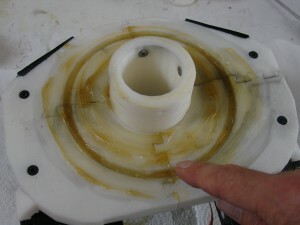 Put a good load of greaseon the wormgears and in the passthrough hole for StomGear. 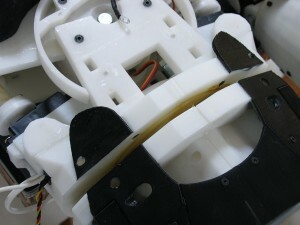 Check the potentiometer hole on StomGear and position it as shown. Make it go all the way through your assembly. 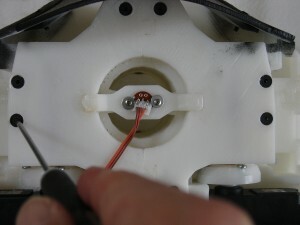 You will need to remove the potentiometer from your servos as described in this tutorial. 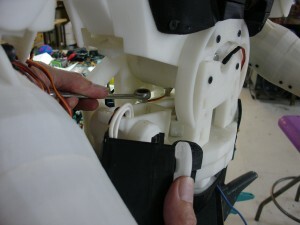 Remember that the Vigor VSD-11AYMB servos are slightly different than the Hitec805BB. The below tuto explains for Hitec805BB. 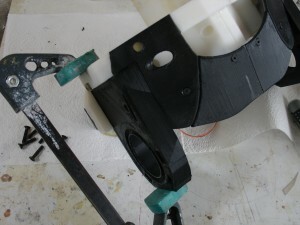 and cut as usual the small piece that block the full rotation of the servo motors. 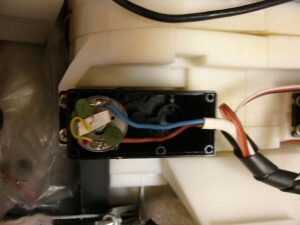 Make sure you have reversed the color cable to the motor polarity. This way one motor will turn one way and the other will turn the other way. Missing pictures: Assemble together on a flat surface BotCapLeftV1.stl and BotCapRightV1.stl . 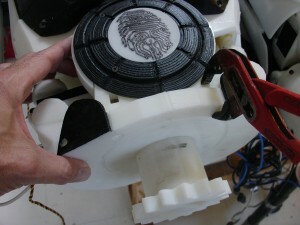 Use Acetone if ABS prints or Epoxy if PLA prints. Mount the potentiometer on MidPotHolderV1.stl, respecting the small metal positioner. 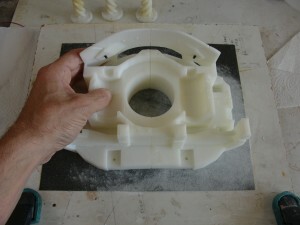 Glue MidPotHolderV1.stl to the BotCap. 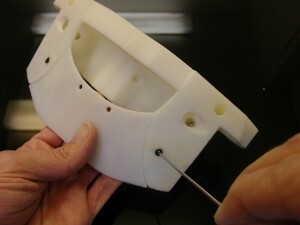 Set the BotCap assembly on the main assembly. 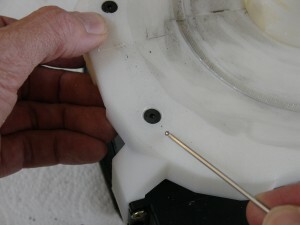 Use 4mm screws to fix BotCap to main assembly. Mount TStoLowLeftV1.stl and TStoLowRightV1.stl to your main assembly. 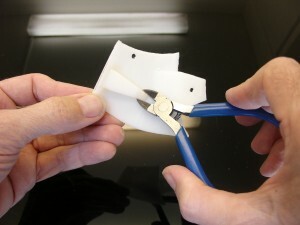 Using a clamp to press fit will ease the job. 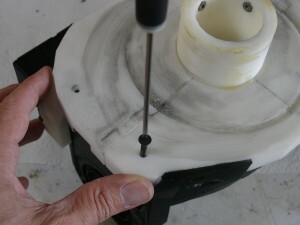 Add 4mm screws, making sure the screw head is well sinking into the part. Otherwise it will restrain rotation between TopStomach and MidStomach. Add screws on the sides as well. Add a good load of grease on your assembly flat bed. 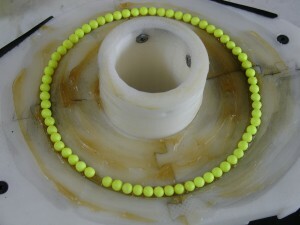 Add some 6mm ball bearings, I used BB Gun balls which do the job quite well until now. Apply grease on the flat bed of TopStomach as well. 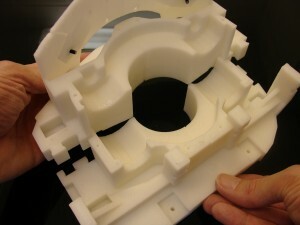 Fit in the StomGear to assemble TopStomach and MidStomach together. 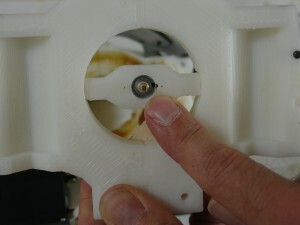 Adjust the bolts to make sure TopStomach and MidStomach are well tight. But don’t overtight because we want to keep these parts some freedom for rotation. Time now to run some script test to see if all is set in order. This is awesome! Thank you! From the videos it looks like this set up works really well. I am slowly working my way down the torso to the stomach parts and am starting to review this as I get closer. 1. 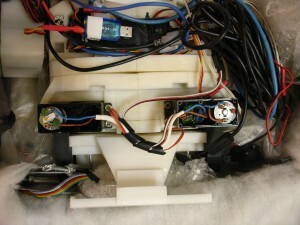 Are two servos necessary to make the stomach rotate? Does one of the big servos not generate enough torque to move everything? 2. 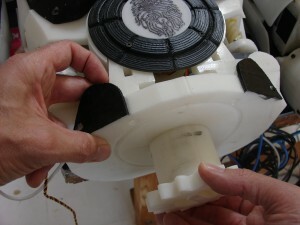 The slave servo is an interesting solution. 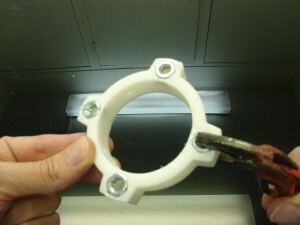 I’m guessing that you could not just reverse the worm gear because the stomgear is angled. Correct? I truly appreciate all the work you put into this. Thank you! I’m glad you enjoy the build up process! 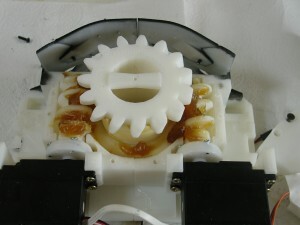 I had tried a version with a reversed wormgear with a no angled stomgear, but since stomgear turns in one direction it necessarily implies to reverse the direction of the opposite wormgear. 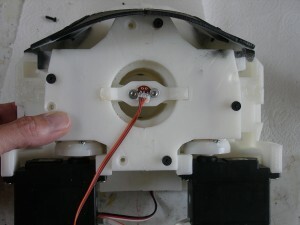 Therefore polarity on the slave servo has to be reversed. Can i use HS805BB as servos or does it has to be Vigor VSD-11AYMB ? For the Midstomach side rotations, you need two HS805BB. For the LowStomach rotations you need two Vigor servos. Is there a MidPotHolder for a square potentiometer? I can’t find any mention of it on forum or thingiverse. Do you mean to install the VSD-11AYMB servo board in the HS805bb structure in the Step3? I see the VSD servo motor is the 50kg spec, can I use other models of the 50kg steering servo plate? I use this servos, and she works well. Thanks for your information about this servo. on the use of the cys 8503 – do you have a design for the coupling plate? 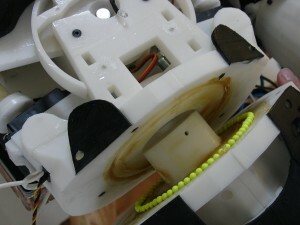 the servo head seems quite far away from the worm gear? How did you bridge the gap? 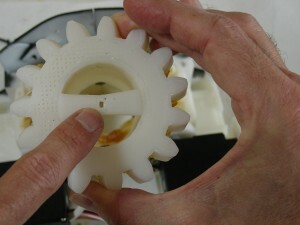 Its very tight between the worm gear and the casing / mount? 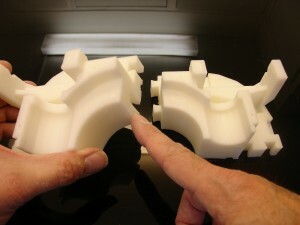 Would be intrested in seeing a picture of how you coupled it. Also the cys 8503 is shorter than the HB-805bb so will have to alter the mount too for it to be secure.